Fig. 1. 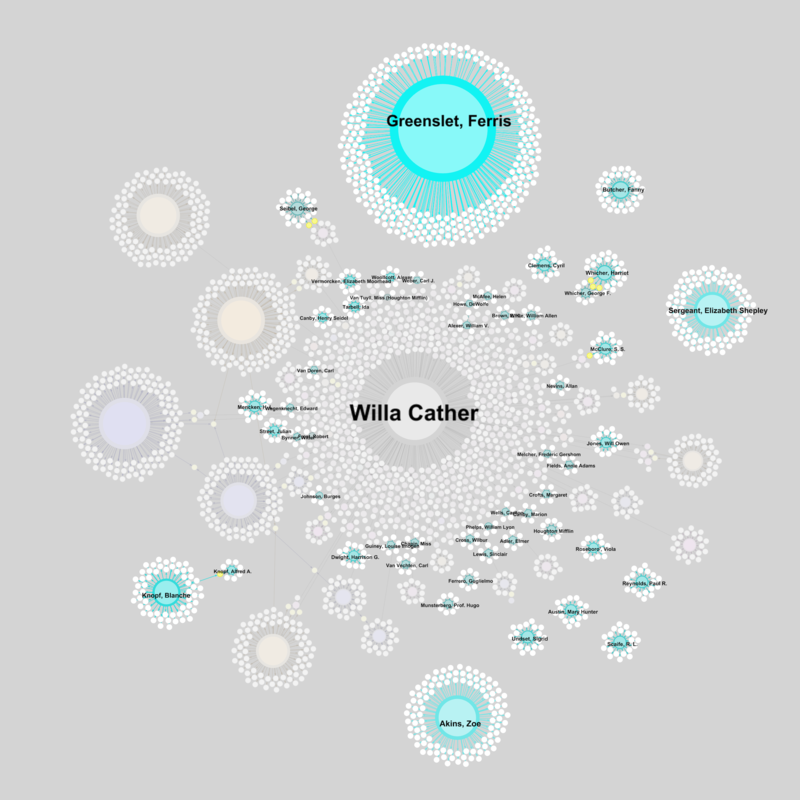 A network visualization of Willa Cather’s literary correspondents. Both these positions misrecognize our current situation and falsely separate digital work from modernist studies proper, to the detriment of both. The new modernist studies is now always already digital, to put my argument in its broadest form, because it is mediated by our contemporary digital cultural and infrastructural condition. Here I agree with Adam Hammond’s emphasis in “From Modernism to moDernIYsm” on an expanded notion of modernism and its afterlives, as well as the need to respond to the way that modernism functions in cultural productions now. But the nature of that response cannot be formulated in advance, much less reified into a position that would advocate more technology, more terminals, fewer books. We are always already digital modernists because the knowledge ecology of our field has shifted, introduced new actors and pathways, unanticipated conjunctions of paperwork, databases, editorial apparatus and compositional tools—the most important of which may be the humblest, as Matthew Kirschenbaum’s Track Changes demonstrates in the case of the humble word processor. Yet the conventions of academic labor require us to conceal those changes, erasing the action of some of the central agents within literary studies. These digital actors, experiences, and traces, the marks of the material practices through which our scholarship is now produced, constitute some of the most important absent presences in our discipline. We are all digital modernists now, first, insofar as we organize our work, research, and scholarly fields through digital means. Here I do not mean the MLA’s Humanities Commons and its initiatives for digital scholarship and discussion, promising though these efforts are. More important, yet far less examined, are the simplest first steps of the modern research process: those that take us to digital bibliographies and to database indexes. This is perhaps the first step of research training in the field, one often forgotten, relegated to the library, delegated to a research training week, or simply assumed as part of any intelligent undergraduate’s self-training. Yet of course—yet how often do we note it?—the precise intersection of massive databases run by for-profit (and originally military-library-industrial) companies like EBSCO, nonprofit scholarly associations, and the traditional oral byways of academic training are anything but self-evident. The shift in the organization of our scholarship extends to the use of digital library finding aids and archival descriptions, increasingly formalized and aggregated through services like WorldCat, to locate books and archival materials. Digital resources and tools operate within specific subfields as well, often individually maintained and operated, yet essential to a particular community. We might think of the Virginia Woolf listserv, Adrian Dover’s collection of James texts, or the electronic version of the T. S. Eliot “Chronology” developed by James F. Loucks. Scholarly use and citation of such tools and forums rightly recognizes the essential yet often unmarked ways in which the forms of our scholarly work have changed. Contrast the wonderfully exhaustive research process detailed by Umberto Eco in 1977, in which one begins with broad reading, location of key works, extensive note-cards, and library research trips from Genoa to Bologna in search of the essential works on the concept of metaphor in the Italian baroque. Eco’s research process is characterized by a drive to go to the source, the primary text, with recent secondary commentary undergoing an inevitable if fascinating process of corruption and misrecognition. In this process, certain key commentaries mark the process of textual and interpretive mutability (and thus proceed according to one of the basic narrative schemas of Eco’s own novels). These practices embody a process that differs markedly from the current standard advice to read only the most recent secondary criticism, perhaps within the last twenty years, alongside the primary text itself. Indeed, the fundamental heuristic assumptions of the databases themselves are oriented to “current” secondary sources (a basic search on the MLA Bibliography will display newest entries first) and the ambiguous criteria “relevance,” which privileges new sources that are marked with keywords and thoroughly indexed. How often do we consider the role of database search defaults in the evolution of our scholarship? Indeed, we are all digital modernists now precisely because we conceal the traces of our digital mediations, a paradox that extends from the research process to our endnotes and bibliographies. We prefer to cultivate the image of the ink-stained and archive-dusted traditionalist, carefully listing the call numbers of boxed correspondence, the fiche series of an institutional archive, and exact location of a unique and complete run of The Egoist (however relevant to our argument), rather than admit to being the pixel-spotted, carpal-tunnel afflicted, PDF-engulfed drudges that we are. This image is not cultivated simply out of archival fetishism, but rather because a lasting mark of the credibility of our scholarship is its elaborately crafted illusion of proximity to the Real Thing, the hand of the author, the debris of History. The theory revolutions in literary studies after 1968 may have displaced that impulse from the author’s hand to the theorist’s material and cultural situation, but it clearly retains its force. Simply referring to the excellently curated Modernist Journals Project in our notes gives, we may fear, a certain tertiary quality to our work, along with the impression of laziness or lack of thoroughness. And we do this no matter how little we may know about the formation of the particular material archives we may cite instead, and despite the elision of key materials like advertisements in the binding process. Exactly because we are all digital modernists, subject to textual and archival transformations beyond our ken, we prefer to avoid the fact. The elision of the traces of digital mediation continues, of course, in the drafting and revision process, a third way in which we are all digital modernists now. Kirschenbaum’s Track Changes recalls some essential differences produced by the first generation of word processing that we often forget: the ability to erase and rework enormous stretches of material without material difficulty; the ability to systemically substitute one key word for another across a document; the illusion (and occasional reality) of relative impermanence and mutability provided by the substitution of pixels for ink; the transfer of a practice of writing into an ethos and ontology. Later innovations include the means to track and label every successive revision, comment, and erasure in a given text. We might well wonder how Pound’s suggested changes to The Waste Land would have fared under such a writing regime. We are all digital modernists throughout the modern process of manuscript submission, revision, querying, and final publication, in journals and monographs that tightly conceal the essential work of copyediting, pagesetting, and manuscript preparation that undergirds a final product worthy of briefly gracing the desk of a Dean or Provost (and, one hopes, those of others as well). The careful elision of all the fundamental changes involved here, and the useful reification of complexly striated and fractured digital documents into the more-than-momentary monument of a bound volume, attest to a fundamentally unacknowledged sense in which we are all digital modernists now. We are all digital modernists now when we teach students, undergraduate and graduate, who famously have been born into the state that our scholarship still strives to erase. We know that our students are “digital natives,” whatever that phrase might mean, and often struggle with academic systems conceived in quite different knowledge ecologies. Hammond outlines one excellent approach here that links the DIY practice of the little magazines to the contemporary production of student zines, moving from “what [modernists] produced to how they produced . . . seeking not just to understand modernist print practice but to do it.” As in this example, the response to the divergence between print and digital epistemologies is not at all obvious, and certainly is not just to “make it digital” within the classroom. The immersion of our students in digital environments, and the continual distractions concomitant with digital environments, might well require more emphasis on a slow, careful process of attentive reading, not less. Students’ lack of experience with printed texts, much less scholarly editions, calls for explicit training in the mental habits and neurological effects of print literacy, not for the adoption of e-texts. Even, or especially, in digital classrooms, our students need to understand the persistence of essential questions, goals, and habits of mind, and the evanescence of our particular paths towards those goals. They need to understand the process of selection, that the preparation of materials matters more than the digital or physical nature of those materials, that no new argument occurs without a response to previous arguments. They need to be trained in assumptions of print literacy that once (and in many circles still) are taken for granted. These are problems for any pedagogy that engages the changing modes of technological literacy over time, understanding literacy as itself a complex technology: and that of course is precisely the point. The most arresting ways we are all digital modernists now occur through the radical transformations of our most familiar objects of study and their new forms in digital environments, uses that should inform all modernist scholars. Let me give one brief example of this kind of conjunction, from my work on digital correspondence. Literary correspondence forms one of the most basic and apparently self-evident strata of evidence used in our scholarship: to begin an article, to prove a biographical point, to demonstrate the existence of a literary circle, to date the composition of a text, to suggest larger cultural and social contexts. The standard editions of scholarly correspondence, such as the recently expanded T. S. Eliot letters or the enormous Letters of Samuel Beckett project at Emory, are among our most lasting and fundamental scholarly efforts. Yet the ways in which scholars study correspondence have begun to change, led by scholars in earlier periods, but in ways that will alter modernist scholarship as well. Well-funded and organized efforts such as the Early Modern Letters Online and the Republic of Letters (in the eighteenth century) have developed new ways to organize and envision whole sets of correspondence, rather than the work of single authors or paired correspondents. Our own Twentieth-Century Literary Letters project, for example, has taken up the challenge of thinking about linked correspondences, correspondence visualization, and the infrastructure needed to build a union catalogue of twentieth-century literary culture. A key feature of these projects, as with any lasting scholarly resource, is the audience: we attempt to speak not only to scholars of textual encoding, bibliography, and authorial biography, but to any scholar interested in studying the networks of literary culture in their period. Precisely because we are all digital scholars now, digital correspondence projects address themselves to scholars of Beckett, Eliot, Proust, or Woolf. We are all digital modernists now because we are all addressed by such projects. Yet a clear objection might be lodged here: isn’t the most technically innovative new work in digital modernist studies developed with the help of technical arguments and tools that are inaccessible to most modernist scholars? Here we might think of Hoyt Long and Richard Jean Soo’s work on the haiku as a form in the little magazines, Alex Christie and the INKE group on a “Z-axis” map of Djuna Barnes’s Paris, or the network-graph approaches developed in the recent “Visualizing Periodical Networks” issue of the Journal of Modern Periodical Studies. Don’t these projects address themselves only to the technically-competent “digital modernist”? The answer, in short, is no: not insofar as they count as modernist scholarship. All these examples develop innovative arguments with the help of digital tools, but they are addressed to all scholars interested in haiku, Djuna Barnes, or modernist periodical culture. The relative difficulty of the tool has nothing to do with its purposes: Lacanian readings of Faulkner are interesting when they show us something about Faulkner, not Lacanian theory. If we all learn from distant readings of the haiku, or from the Z-axis approach to imagined literary topographies, then we are all digital modernists now. And if we are all already digital modernists, the conversation about the relation between modernist studies and the digital humanities will have to be understood quite differently. Let us end the argument by drawing out an implication of the initial claim that might seem at first its logical opposite. If we modernist scholars are all digital modernists now, it does not follow that we need a new sub-identity “digital modernist” to which we all belong. My argument has been more nearly the opposite: modernist studies is already contiguous with digital methods and approaches along all its fractal boundaries. The next generation of work in the field might prefer to abandon “digital modernist” as a category altogether, preferring instead “Joycean topic modeling” or “modernist spatial studies” to designate the tie between field and our critical method. The relationship between modernist studies and digital method would need be reinterpreted as a skein of weak ties, as I have argued elsewhere, that bind together specific modernist objects with particular approaches, models, paratexts, affective engagements. Whatever terms we use, the relation between scholarly communities and digital practices must be treated as a mutual problem, rather than a special preserve of interest only to practitioners of the Digital Humanities. We digital modernists need to understand ourselves not as part of a methodological avant-garde, or digital-native-interpreters, or as misunderstood technophiles, but as an essential part of the active transmission and contestation of knowledge in our discipline. Our current self-understanding lags behind this reality of the field. If we are all digital modernists now, we don’t yet know it. See Geoffrey Little’s parallel argument for library and information science, “We Are All Digital Humanists Now”; the famous but partial original citation from Milton Friedman is found here: “We Are All Keynesians Now,” Time, December 31, 1965, 74. The genre of this argument derives indirectly from Paul de Man’s “Resistance to Theory,” Yale French Studies 63 (1982): 3–20. My position is a standard argument that has been made in relation to other fields, or for the humanities generally: see in particular Lincoln Mullen’s excellent short argument in “Digital humanities is a spectrum; or, we’re all digital humanists now,” last updated April 29, 2010. But given the widespread segregation of “digital scholars” from lay scholars in both the digital humanities and modernist community, and continued misunderstandings on both sides, this position needs to be articulated for modernist studies more particularly. This cluster itself marks one of the first times the major journal in our field has explicitly addressed the question of the relation of digital humanities and modernist studies, itself a significant fact. See Dennis Tenen’s Plain Text: The Poetics of Computation (Palo Alto, CA: Stanford University Press, 2017) for a parallel argument on the ways “we have always been digital” (185). This is done every time modernist scholarship is divided into “traditional” and “digital”; the wonderful “Modernist Manifesto of Digital Humanities” parodies and reverses this trope by using modernist style to re-imagine the underlying positivism of some digital humanities methods. See Alex Christie, Andrew Pilsch, Shawna Ross, and Katie Tanigawa. “Manifesto of Modernist Digital Humanities,” last modified September 4, 2015. A variety of recent important work elaborates on the necessary relationships between digital method and modernist studies: see Stephen Ross and Jentery Sayers, “Modernism Meets Digital Humanities,” Literature Compass 11, no. 9 (2014): 625–33; Shawna Ross and James O’Sullivan, eds., Reading Modernism with Machines: Digital Humanities and Modernist Literature (London: Palgrave Macmillan, 2016); and Jessica Pressman, Digital Modernism: Making It New in New Media (New York: Oxford University Press, 2014). Matthew G. Kirschenbaum, Track Changes: A Literary History of Word Processing (Cambridge, MA: Harvard University Press, 2016). See the MLA’s new initiatives in digital scholarship. According to a reference pointing to a broken link on that very different form of knowledge infrastructure, Wikipedia: en.wikipedia.org/wiki/EBSCO_Industries. Adrian Dover’s collection, once at http://www.henryjames.org.uk, is now sadly defunct: see http://arch.oucs.ox.ac.uk/detail/94333/index.html. See James F. Loucks, “The Exile’s Return: Fragment of a T. S. Eliot Chronology,” ANQ 9, no. 2 (1996): 16–39; and Ron Bush, “‘Intensity by Association’: T. S. Eliot’s Passionate Allusions,” Modernism/modernity 20, no. 4 (2013): 709–27. See Umberto Eco, How to Write a Thesis, trans. Caterina Mongiat Farina and Geoff Farina (Cambridge, MA: MIT Press, 2015), 79–102. For a history of the Modernist Journals Project, see Jeff Drouin and Sean Latham’s article in this cluster; see also modjourn.org. See Robert Scholes and Clifford Wulfman, Modernism in the Magazines: An Introduction (New Haven, CT: Yale University Press, 2010). On the over “digital natives” see N. Katherine Hayles. “How We Read: Close, Hyper, Machine,” ADE Bulletin 150 (2010): 62–79. See here the excellent advice of Claire Battershill and Shawna Ross, Using Digital Humanities in the Classroom: A Practical Introduction for Teachers, Lecturers, and Students (London: Bloomsbury Academic, 2017). For more on these efforts, see Gabriel Hankins, “Correspondence: Theory, Practice, and Horizons,” in Literary Studies in the Digital Age: An Evolving Anthology, ed. Kenneth M. Price and Ray Siemens (Modern Language Association of America, 2015). Our project website is migrating to a new location, but those interested in modernist literary correspondence should write the author for inclusion on the interest list. Hoyt Long and Richard Jean So, “Literary Pattern Recognition: Modernism between Close Reading and Machine Learning,” Critical Inquiry 42, no. 2 (2016): 235–67; Alex Christie, Stephen Ross, Jentery Sayers, Katie Tanigawa, et al., “Z-Axis Scholarship: Modeling How Modernists Wrote the City,” and their tool, at http://zaxis.uvic.ca/; “Visualizing Periodical Networks,” a special issue of the Journal of Modern Periodical Studies 5, no. 1 (2014). This assertion is separate from the question as to whether a Lacanian in fact agrees with that distinction in any given instance.